Genuine Fender® '62 vintage Stratocaster® black, 3-ply, 11-hole pickguard for three single-coil pickups. Fits '62 American Vintage Stratocasters and '60s Stratocasters. 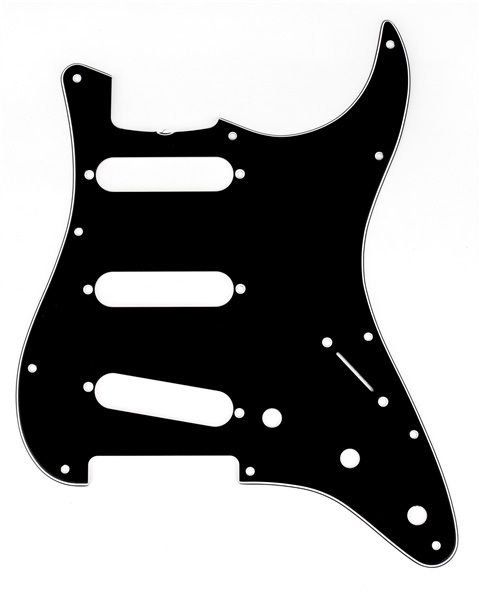 This pickguard does not have any shielding as it comes to us from Fender, you should consider including item # 001-9699-049 to your order to fully shield your pickguard. Some don't have the small notch in the neck pocket.